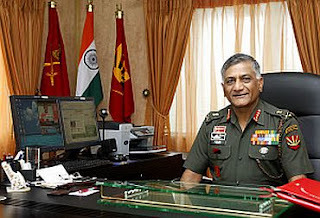 The chief of Indian Army staff, General of Indian Army is be Lt Gen Vijay Kumar Singh. He belongs to Rajput family, in Bapora Village, Haryana. His ideologies are of third generation. He is son of a Indian Army Colonel and his grand father was Senior Junior Commissioned Officer(JCO). He did his schooling from Pilani, Rajasthan. He was commissioned into 2nd Battalion of Rajput Regiment on 14th June 1970. He commanded the same unit when, it was relocated to the Line of Control with Pakistan. Singh graduated from the Defence Services Staff College as a honours graduate of the United States Army Infantry School, a graduate of the Rangers Course at Fort Benning and the United States Army War College in Carlisle, Pennsylvania. In Rangers course which he attended in U.S.A he won the first position in the combat operation. General Singh is one of the most experiences officer as he has faces high altitude operations as well as insurgency, he have witness and served during 1971 Bangladesh war. He has been positioned in many position in his career. * Military Operations Directorate at the Army Headquarters. * Brigadier General Staff of a Corps during 'Operation Parakram' when Indian troops were mobilised on the border in the wake of the attack on the Indian Parliament in 2001. * Commanded Ambala-based 2 Corps and Jalandhar based 11 Corps in Punjab state. * Instructor in the Indian Military Training Team (IMTRAT) headquarters in Bhutan. General Singh was awarded the ”Ati Vishisht Seva Medal” (AVSM) for distinguished service while commanding a counter-insurgency force.